The jewel in the Wai-O-Tapu crown, the Champagne Pool, is a magnificently coloured spring with a surface temperature of 74 degrees C. The vivid colours strike you as soon as you see the pool and the vapour rising from the surface carries the unmistakable perfume of hydrogen sulphide ('rotten egg gas'). Me - with the rotten-egg gas blowing away from where I am standing. 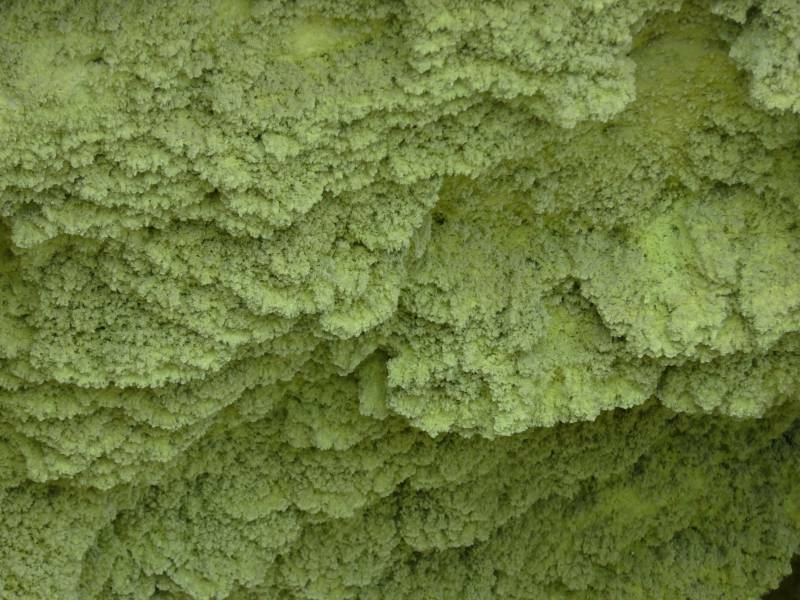 Devil's Home is a collapsed crater where volcanic activity has coloured the wall a greenish yellow. It isn't hard to imagine how this feature got its name. The multi-coloured Artist's Pallete gets its colour from the overflowing mineral-laden water of the Champagne Pool. This looked more like bubbling green sludge than opals to me but it was fascinating nevertheless. I am not sure even The Devil would want to take a bath in this. Sadly, there were some dead birds floating at the edges - a testament to how dangerous the pool is. As we watched, several more birds were dicing with death by swooping down, skimming the water and flying off again. I have no idea what they were doing or whether they appreciated the danger they were in. You can't really see it in the photo but there were bubbles in the centre of the oyster pool where the water was hot enough to boil. 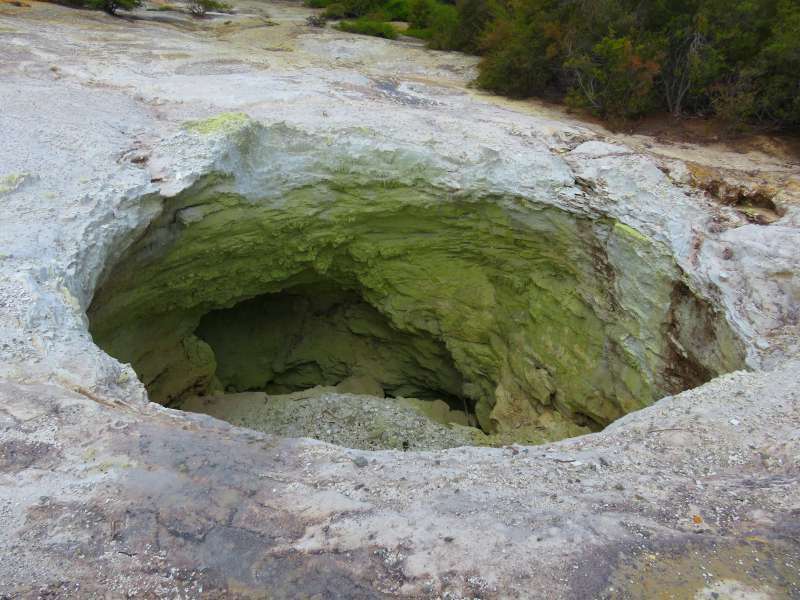 The cauldron-like Mud Pool is a few minutes up the road from Wai-O-Tapu. It is all that remains of an ancient mud volcano. Don't miss it! Trying to catch a decent photo wasn't easy. 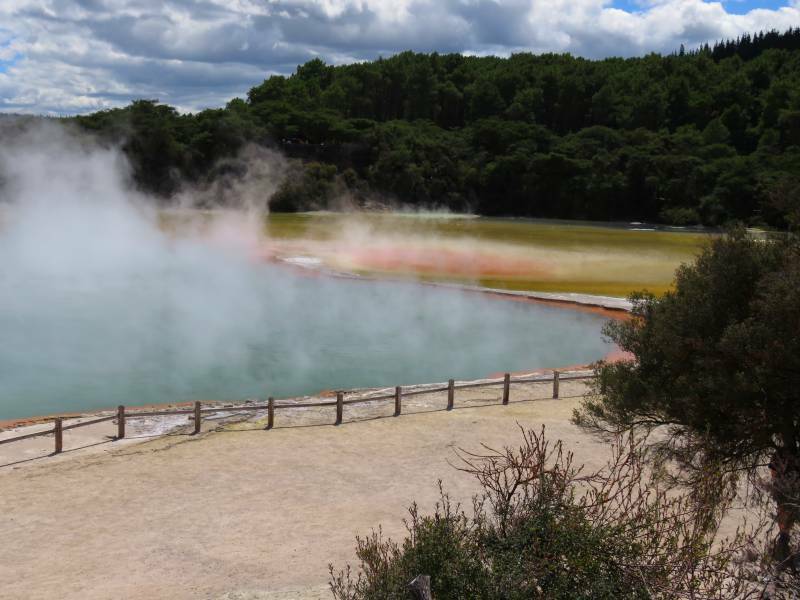 There are 3 kms of paths winding through Wai-O-Tapu, divided into three sections. Section 1 is 1.5 km, sections 1 & 2 are 2 km and sections 1, 2 & 3 are 3 kms. The whole park takes a couple of hours to walk around slowly. The Lady Knox Geyser is in a separate area, a 3 minute drive from the main park. It erupts at 10.15 a.m each day. Wai-O-Tapu is easy to walk around. There are boardwalks and formed pathways throughout but wear sensible shoes. Flip-flops, sandals and other open-toed shoes aren't practical. Bring a hat, water and sunscreen. If you visit at lunch time, the cafe has a good range of food and a very pleasant sitting out area. 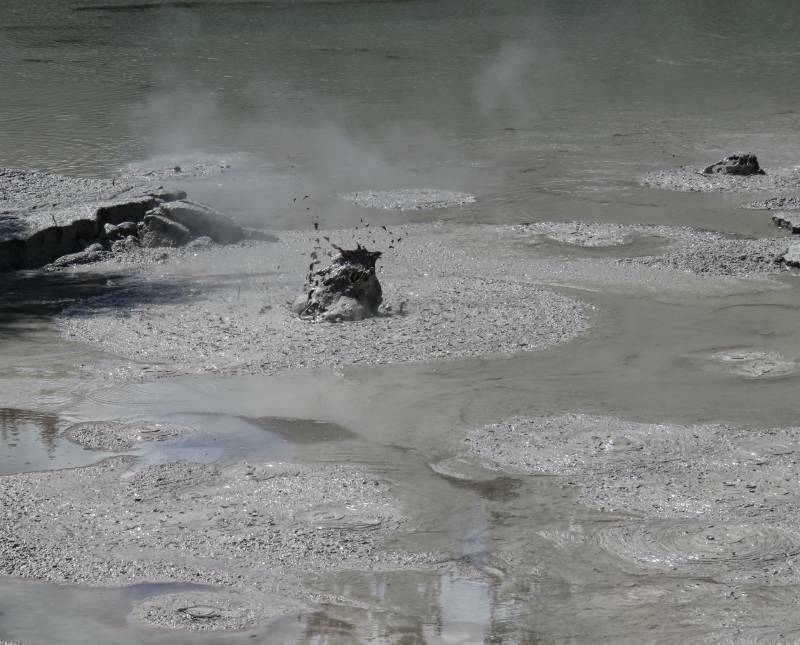 Don't miss the Mud Pool - a large area of ferociously bubbling and erupting mud. It is outside the park, a few minutes drive from the entrance. Wai-O-Tapu is between Rotorua and Taupo in New Zealand's North Island, approximately 20 minutes drive from Rotorua and 40 minutes from Taupo. From April to October Wai-O-Tapu is open between 8.30 am and 5 pm with the last admission at 3.45 pm. from November to March it is open between 8.30 am and 6 pm with the last admission at 4.45 pm. Wai -O-Tapu is closed on Christmas Day. Admission prices are NZD32.50 for adults, NZD11.00 for children and NZD80 for a family of two adults and up to 3 children. Children under 5 years old are free. 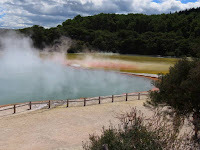 Click here for my post on our visit to Wai-O-Tapu two years ago. Note: David and I received complimentary admission to Wai-O-Tapu. I loved the colours at Yellowstone when we were there but the Champagne Pool definitely gives Yellowstone a run for its money. It isn't difficult to take great photos of such extraordinary natural beauty. 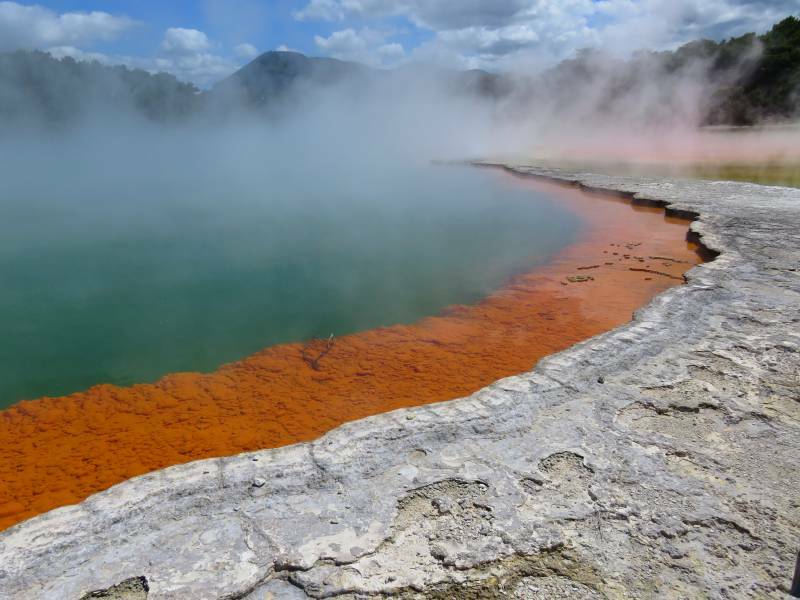 Beautiful photos of Wai-O-Tapu, and very helpful information. Can definitely see the bubbles in The Oyster Pool. You should have seen the bubbles in real life - they were amazing. 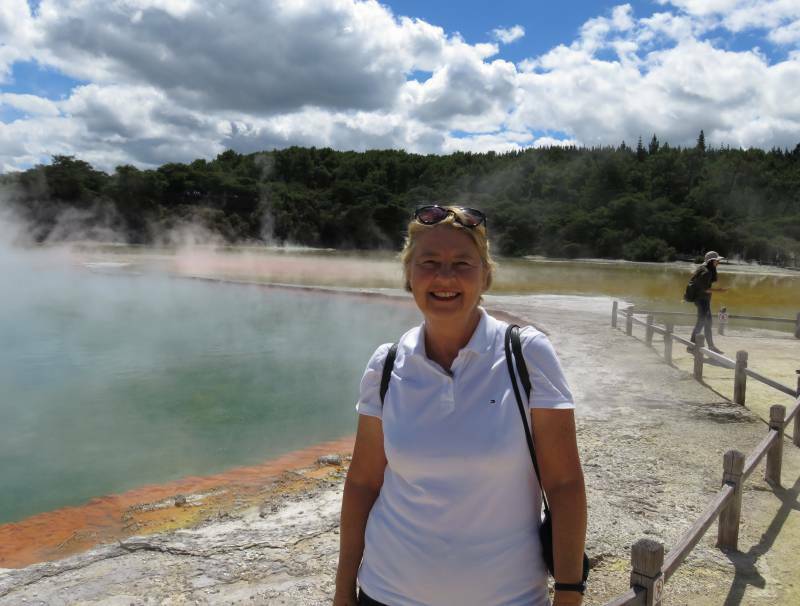 There is lots of geothermal activity in Rotorua. 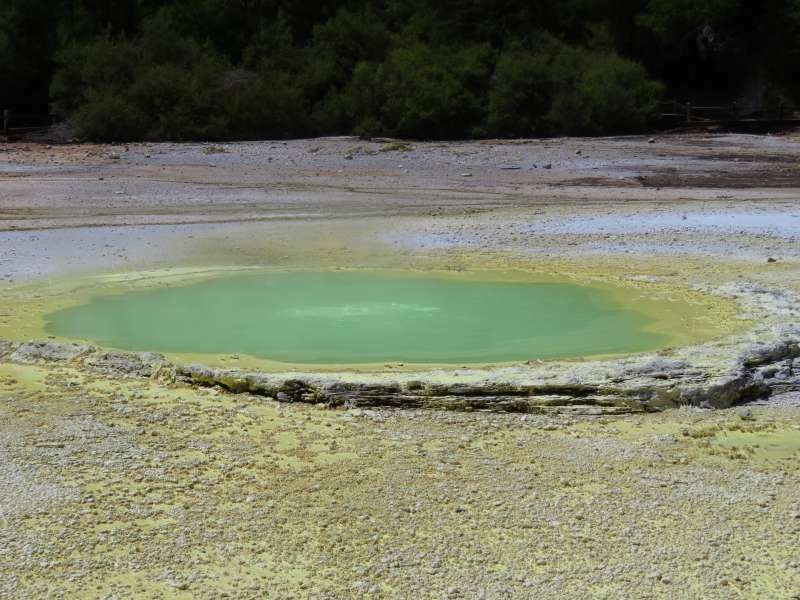 Wai-O-Tapu has some of the most interesting features. There are some areas with free-to-see geothermal features. A lot of the hotels in the area use geothermal bores to heat their properties in the winter. 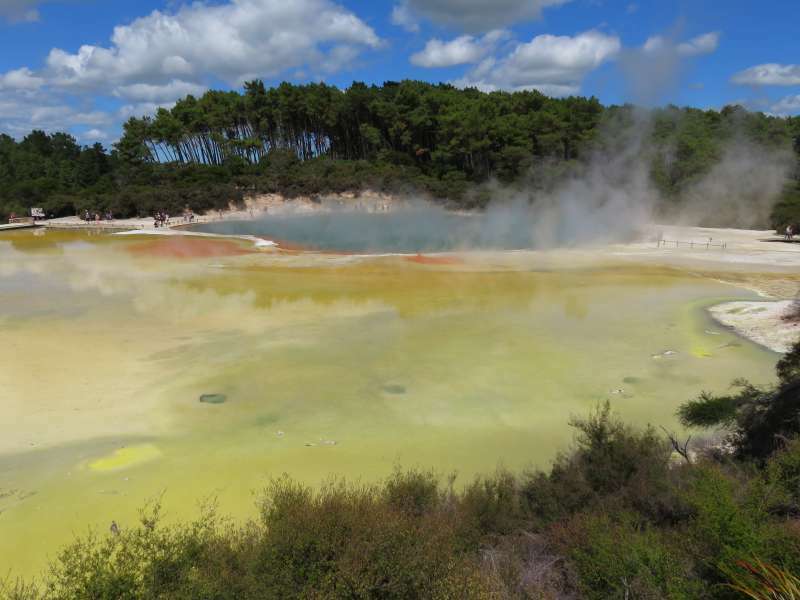 I have walked through some of the free areas and they are fascinating but I have never seen anywhere else that has the vivid colours of Wai-o-tapu. It certainly is a wonderland Lyn, loved your photos with all the gorgeous colours... and the smell of rotten eggs is something worth tolerating to see the geysers and mud pools. Haha - we stayed at Taupo each time we visited Wai-o-tapu. Years ago we stayed at Rotorua with our boys and the smell seemed to permeate everything. The boys and I thought it was great but David wasn't so impressed - lol! I didn't really notice the smell this time. It depends very much on which way the wind is blowing. It is a fascinating country with stunning geography. David and I love New Zealand. The only downside is that it is an expensive country to travel in. I don't think the colour of the Champagne Pool changes but several of the other pools do. The first time we went to Wai-O-Tapu it was cloudy and threatening rain, the second time was bright sunshine and the colours were just as good on both occasions. I love New Zealand but have only visited the South Island. I am tentatively visiting New Zealand again this fall. I would love to see Wai-O-Tapu as it's so different than anything I've ever seen. We spent years just going back to the South Island, thinking that the North Island wouldn't have as much to offer, then we discovered we were wrong. The North Island is just as beautiful and interesting. Lyn this will definitely be on the agenda should we head to New Zealand. What strikes me is the variation of colour from pool to pool. The Devil's Pool makes me want to call out warnings to the birds in a mother duck kind of fashion. I was really sad when I saw the dead birds. There were about four of them floating in the one pool. In an earlier crater there were birds nesting in the side of the crater. I couldn't help thinking that it was a real baptism of fire for the baby birds taking their first flight. What a pretty place; I'd never heard of it before. With so much hot water flowing, I can't help but wonder - are there any health spas nearby? I am not a health spa person but there are quite a few places where you can take soak in hot springs. You can even just head down to a nearby creek - as long as you don't mind a bit of mud. The Champagne Pool is beautiful! And very sad to hear about the dead birds around the Devil's Bath. That is a very magnificent green though. I was a stunning colour but obviously very deadly. Loved that photo that you took at the mudpool, with the mud bubbling over. I took an even better video but I couldn't get it to load on my blog. I must have another go at it. I read your latest post from Macedonia so I didn't expect to hear from you this week. I hope wherever you are now it is a bit less hassle than Macedonia was. How cool! Love how the Champagne Pool (something that sounds so nice) smells like something not so nice! Haha - I read that it was named The Champagne Pool because of the bubbles rising to the surface. The smell didn't bother me, although I don't think I would like to be around it all the time. The rain doesn't seem to dull the colours, it just makes it a bit less pleasant to walk around. I'm glad you still enjoyed it. This really seems like a great place to visit! I have never seen anything like this and the different colour pools are a fascinating sight! These birds must have a death wish if they keep going in the green water and I can only imagine the rotten egg smell haha! This reminds me I need to go to NZ asap! Thanks for sharing! My pleasure. New Zealand is a stunning destination. David and I go back there every year. I also loved Yellowstone. Strangely, we haven't been to New Zealand - too close to home, I suppose. 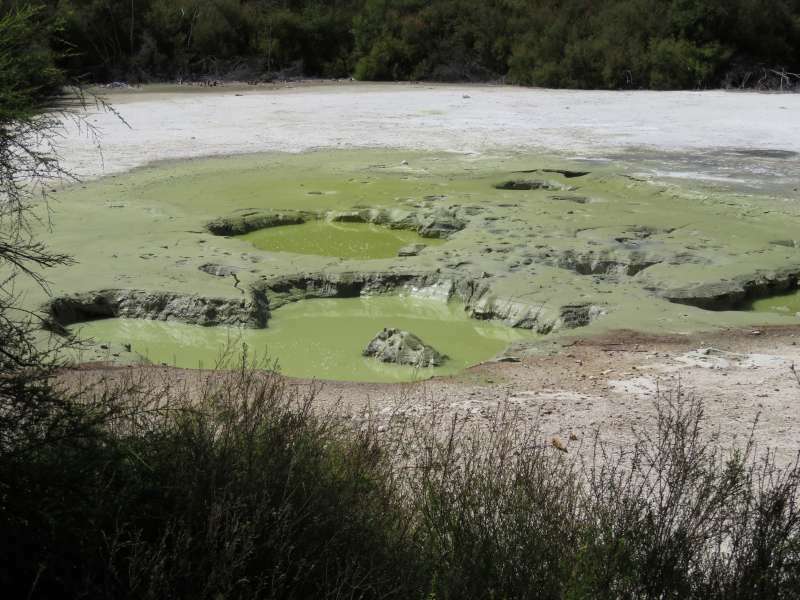 But when we eventually get there, Wai-O-Tapu will be a great place to visit - rotten egg gas and all. It took us years and years of travelling before we first went to New Zealand. Our reason was much the same as yours. It is so close, we kept saying we could go there anytime. We flew over it a lot! Once we got there though we realised what a stunning country it is and we have now been back many times. Its only downside is cost. It is not a cheap destination. I have been to Hawaii a few times and never seen any geothermal activity. Is it on the Big Island? we haven't made it there yet. It is on the list though! 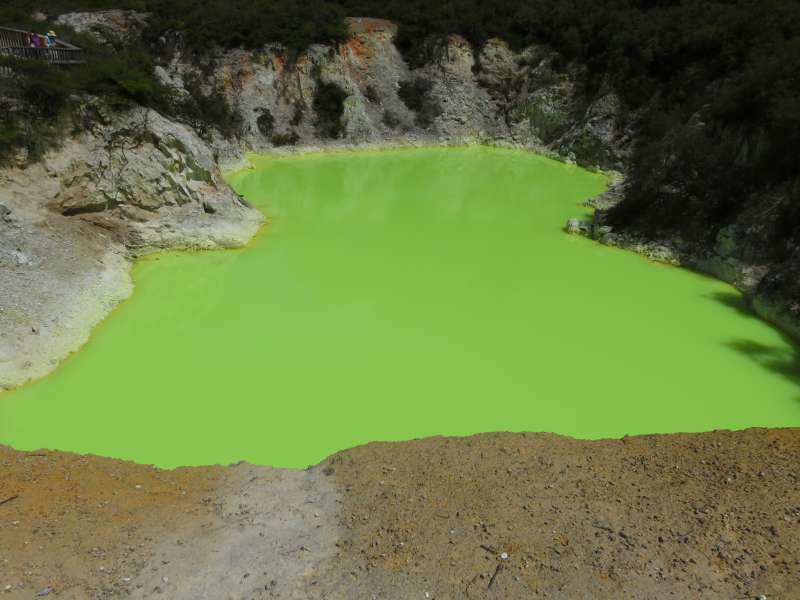 When you first wrote that you were going to return to Wai-O-Tapu, I wondered why return. Isn't once enough? I was wrong. Really wrong. What an interesting place with such diverse sites to see and I felt so sorry for the birds who underestimated the danger of the Devil's Bath. Wai-O-Tapu is one of those places you can just keep going back to. The birds were sad though. Thank you for sharing and taking what look like non altered photos. so many would be tempted to make the colours pop more but these are beautiful just the way they are. Amazing natural beauty. The colours are so stunning naturally that you don't need to do much to turn them into great photos - I confess I may have boosted them just a little though.